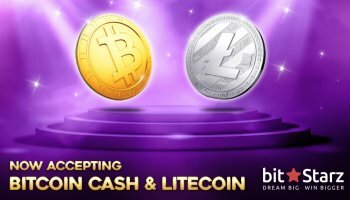 BitStarz adds the ability to play Bitcoin Cash, Litecoin, Dogecoin and Ethereum! From now on, you can play BitStars not only on bitcoins and real money. Let’s greet the new altkones! With a little delay, but still with great joy we inform that in the world of gambling a new era is beginning on the crypt, we hope that it will bring convenience, joy and, of course, more big gains to the player. Now in the online casino BitStarz (as well as in several other game platforms from SoftSviss) there is an excellent opportunity to play your favorite slot machines and board games for other popular crypto-currencies alternative to bitcoin, for example, Bitcoin Cash, Litecoin, Dogecoin and Ethereum. It all started with the fact that three weeks ago, on January 26, 2018, the BitStarz site was able to create a game balance in new crypto-currencies – Litecoin (LTC) and Bitcoin Cash (BCH), the latter, by the way, was recently added to Coinbase. BeatStars casinos became one of the first, where there was a unique opportunity to make a deposit using the leading altcoyins and at that time it was already known that as soon as possible, the addition of several more popular crypto currencies is expected. Bitstars managers kept their word and literally a few hours ago made an informational newsletter among all their players that from now on anyone can also replenish the balance of Ethereum and Dogecoin. – Bitcoin Cash (BCH): formed a few months ago as a result of the division (hardfork) bitkoyna and is considered at the moment one of the most promising currencies, most likely due to a direct relationship to bitcoin. Immediately after appearing on trading exchanges, bitcoin cash generated a real buzz among traders, and interest in BCH arose mainly due to the increased size of the blocks, which increased the processing speed of transactions, significantly reduced the commission and allowed to combine more transfers. The main idea of creating a crypto currency was the competition on the volume of transactions with the largest payment systems for real money, such as PayPal or Visa, which easily explains the huge popularity and demand of this currency in the field of gambling and gambling. – Litecoin (LTC): is also one of the advanced alternative digital currencies, but unlike bitcoin cache it exists already from 2011. After the appearance of lightcoyn became not just an additional opportunity for asset diversification, but also a convenient option for everyone who wants to risk and try their luck at the online casino. Thanks to the fast confirmation of payments and the flexibility of technical solutions, Litecoin became a reliable addition to bitcoin and quite naturally and deservedly increased its value throughout the entire year 2017. – Dogecoin (DOGE): despite the frenzied popularity of these moments and the huge number of fans and followers, dogicoin is not a promising and promising crypt, especially when compared with other altcoyins listed in this news. But it is this crypto currency that has open access to its source code and a favorite logo that shows a famous memo about a sad dog. The funny fact is that initially the crypto currency was created for fun, but by popularity it is almost inferior to the leading koins and tokens. – Ethereum (ETH): there are hardly those who have never heard of this crypto currency, confidently occupying the second place in terms of capitalization, second only to the cue ball. The ether has never had staggering growth, but it is still considered one of the most powerful, promising and popular crypto-currencies in the world, mainly due to the use of all the advantages of blocking technology and the principles of decentralization. Summing up, you can safely say that now playing casino for crypto-currencies and especially for altkoins will be many times easier, because players will not have to wait for several hours until bitcoin collects all necessary confirmations for the deposit or pay crazy commissions because of congestion. Casino BitStarz is one of the oldest bitcoins of casinos in the industry and most recently they won a very significant award in the nomination “The Best Casino of 2017” from AskGamblers. In the assortment of the casino there are not only a huge number of payment systems and crypto-currencies, but also a solid collection of game providers that provide the coolest video slots, 3D slots, slot machines with progressive jackpot and a variety of popular board games. According to the manager of the casino, the addition of new currencies has passed with a stunning success, all thanks to the fact that the casino listens to the wishes of its active and loyal customers. Perhaps in the next few weeks we are waiting for even more interesting news about new deployments and major winnings.